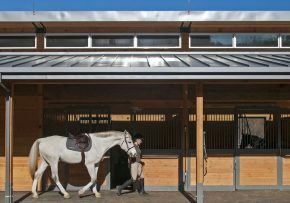 Ketchen Place Farm - Blackburn Architects, P.C. : Blackburn Architects, P.C. On fifty gently sloping acres south of Charlotte, North Carolina, Ketchen Place Farm is a family-owned, female-run farm that breeds thoroughbred and warmblood sport horses. 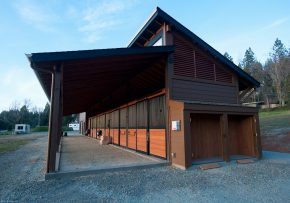 Blackburn Architects provided architectural services for the construction of a 20-stall barn and a not-yet-built, separate four-bay garage with a two-bedroom, two-bath residence above. 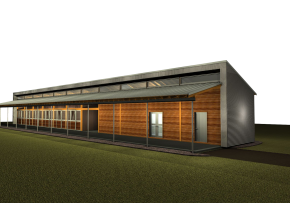 The master plan includes redesign and improvement of roads, fencing, paddocks, a run-in shed, and a well-defined entrance to the facility. 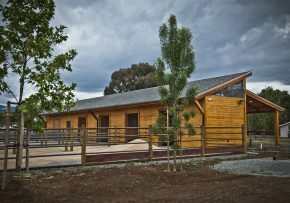 The shed-row style barn, which includes a studio apartment above for the observation of foals, wraps around three sides of a courtyard that doubles as a small sand training paddock.